At Hitting World, we sell pitching and batting screens for training athletes of all ages and skill levels. Our baseball netting is perfect for everyday use and is made from the most durable materials, with steels frames to ensure they are able to withstand rugged, frequent use. Our portable sports screens for pitching and batting practice set up in seconds and allow you to practice virtually anywhere. These screens are great for pregame warmups, backyard trainings and everyday practice to keep your skill sharp even in the off-season. We only carry the most trusted brands, including Bownet, Jugs, Muhl and others used by the professionals who demand quality and precision. Our baseball screens and nets are professional grade, durable and fun to use. The compact, lightweight designs make them easy to transport, and storage is a breeze. Shop now to take advantage of our competitive prices, with fast, free shipping on select orders. New BMX Model for 2017! One-Piece Steel Base means fewer parts and increased stability! The BowNet Big Mouth is a 7' x 7' portable sports net that's great for soft-toss or batting tee practice. It's very durable and sets up in 120 seconds with no tools required. Comes with a zippered carrying bag with straps included. FREE SHIPPING! A slightly smaller, lighter version of the best-selling Big Mouth net - great because of its portability, ease of set up, and outstanding reliability during practice. FREE SHIPPING! The PRO SERIES Bownet Big Mouth Sock Net is a larger, more heavy duty version of the original Bownet Big Mouth. Measures 8' x 8' with pro grade heavy-duty netting and powder-coated lightweight steel base. Comes with a zippered carrying bag with straps included. FREE SHIPPING! The Diamond PRO SERIES Bownet Portable L Screen is completely portable, with a lightweight yet durable design. Measures 8' x 7' with pro grade heavy-duty netting and powder-coated lightweight steel base. Sets up in 2 minutes! Comes with a zippered carrying bag with straps included. FREE SHIPPING! The JUGS Complete Practice Travel Screen is a 7 foot screen with a huge 6.5' x 6.5' Hitting Sock. Perfect screen for offense, defense and pitching drills. Sets up in less than 2 minutes. FREE SHIPPING! The Cimarron 7x4 #84 L Net and Commercial Frame is a great option for batting cages or any application where a narrower screen is desired. This L Screen is built to last and can withstand the hardest hit balls. FREE SHIPPING! A portable, lightweight yet durable training net ideal for pre-game, practice or backyard use. FREE SHIPPING! The JUGS Instant Screen is a highly portable batting practice screen that pops open and closes in seconds, and fits in the trunk of any car. Ideal for short toss, soft toss, and tee drills. Large enough to be used for a practice backstop, the All Fields Net was designed to allow a player to hit to all fields when doing batting drills. Large enough to encourage a batter to correctly "hit the ball where it's pitched". Dimensions are 8 1/2' W x 6 1/2' H. Slips on pillow case style for double protection. A nice alternative to sock nets. FREE SHIPPING! 7' x 7' Frame with Heavy Duty 2.8mm/#45 PE netting. Push button assembly. Net slips on pillow case style. Cut-out is 30" H x 24" w. The bottom of the cut out is 21" from the ground to more easily accommodate softball pitching machines. FREE SHIPPING! Turn your garage into a Hitting Station with this durable 10' x 8.5' batting practice net. Sets up quickly, ideal for home use. FREE SHIPPING! The Cimarron 7' x 7' #42 Sock Net can be used for batting drills, target for pitchers, and hitting balls from a tee. Frame is made of 1½" 16 gauge powder coated steel. FREE SHIPPING! The Cimarron 7' x 7' #42 Softball Net and Frame is designed for softballs only and keeps the pitcher, or person throwing the balls, safe from hit balls. The Softball Pitching Screen is excellent for batting and pitching practice whether you practice indoors or outdoors. FREE SHIPPING! This oversized multi-sport net from Champion Sports can be used for many different training activities! Great for golf, soccer, football, baseball and softball. Dimensions: 7' H x 11' W x 5.6' D.
This durable toss back screen offers training benefits for baseball, basketball, other sports and P.E. programs. It has stable wide legs with suction cups, and can be adjusted for different drills. Folds for easy storage. Toss back area is 48" x 36". Great for batting practice and hitting drill protection! This Pitching Safety Screen, or L-Screen, measures 72" x 72" with a 36" drop to throw through. Heavy duty steel tubing is reversible for left-handed or right-handed throwers. Has heavyweight "pillowcase" nylon netting that easily slides over frame in seconds. FREE SHIPPING! The BowNet Portable Softball Screen is a 7' x 7' portable sports net with a cutout that works great for softball pitchers and softball pitching machines. Note: sold as Net only, and fits the frame for the Bownet Soft Toss or Bownet Big Mouth. The ProMounds Premium L Screen is a high quality protective screen that is optimal for baseball and softball practice and training facilities. Made of 1 5/8" tubing, galvanized and powder-coated green. Has commercial grade #36 Twisted, Knotted Nylon netting. Measures 7' x 7', weighs 40 lbs. FREE SHIPPING! The ProMounds Premium Softball Screen is a high quality protective screen that is optimal for baseball and softball practice and training facilities. Made of 1 5/8" tubing, galvanized and powder-coated green. Has commercial grade #36 Twisted, Knotted Nylon netting. Measures 7' x 7', weighs 40 lbs. FREE SHIPPING! The ProMounds Premium Sock Screen is a high quality protective screen that is optimal for baseball and softball practice and training facilities. Made of 1 5/8" tubing, galvanized and powder-coated green. Has commercial grade #36 Twisted, Knotted Nylon netting. Measures 7' x 7', weighs 40 lbs. FREE SHIPPING! The Bownet Portable Baseball / Softball Backstop measures 9' 6" tall x 17' 6" wide and sets up easily in 3 minutes. Comes with free 48' x 10' x 10' carry bag. The all new ATEC Batting Practice Screen features a larger size, heavier netting and tubing, all adding up to more protection. It is ideal for tee work and soft-toss drills to fine-tune your hitting. New and improved with larger size screen, heavier grade netting and 2'' steel tubing (plus 40% heavier wall thickness). Dimensions: 84" H X 84" W.
This residential grade L-Net and Frame is great for at-home batting cages or use by younger players. Inexpensive, but sturdy and long lasting. FREE SHIPPING! Choose from 4 replacement nets for your baseball L Screen. These nets from Cimarron Sports are high quality, pillowcase-style nets that are either #42 netting or commercial grade #84 netting. Also now available in super duty 8mm netting. Available in 7' x 6' or 7' x 7'. FREE SHIPPING! This Softball Screen Replacement Net from Cimarron Sports is a high quality #42 pillowcase-style net. Available in 7' x 7'. FREE SHIPPING! This Sock Screen Replacement Net from Cimarron Sports is a high quality #42 pillowcase-style net. Available in 7' x 7'. FREE SHIPPING! The Bownet Soft Toss Extra/Replacement Net is a flat panel net that is used for the 7x7 Bownet Portable Sports Net. Easily attaches to any 7'x7' Bownet Frame. 100% UV treated Raschel Knotless Net. FREE SHIPPING! The Bownet Portable Pitching Screen is ideal for travel teams, backyard practice, and anyone who needs to bring a pitching screen to and from the practice field. Sets up easily in seconds. The JUGS 6 1/2' X 6' Square Screen with Sock Net is a high quality Sock Net great for team or individual batting practice. 1 5/8" Powder Coated Steel Frame, Heavy Duty Bolt-on legs and a Double Thick, 240 lb Breaking Strength, Twisted Poly Net. The JUGS Protector Series 7x7 L Screen is perfect for hitting facilities or heavy team use. This commercial grade, heavy duty L Screen comes with a 2-Year Guarantee on the netting and frame. 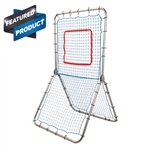 The Muhl 90 Second Net is a lightweight yet durable soft toss net that can be set up in less than 90 seconds. Simply find the open end of the net, pull it over the top of the frame, slide it down to the ground and boom, that's it! Has a durable steel tubing frame and a super heavy duty #45 slip on net. Measures 6.5' H x 7.5' W and weighs only 22lbs. Perfect for taking on the road, and break down is even quicker! Includes carry bag. FREE SHIPPING! The JUGS Protector Series 7x7 Sock Screen is the highest quality Sock Screen we carry. Comes with a 2-Year Guarantee on the netting and frame. Perfect for hitting facilities or heavy team use. The JUGS Protector Series 7x7 Softball Screen is the highest quality Softball Screen we carry. Comes with a 2-Year Guarantee on the netting and frame. Perfect for hitting facilities or heavy team use. The HIT IT Garage Sports Net is a versatile home sports net that turns your garage into a pitching, hitting, and multi-sport practice station. Fits a standard garage door opening size of 16’ wide by 7’ tall. The Champro Infinity Rebound Screen has a unique design that works great for pitching practice, fielding grounders, and pop ups. FREE SHIPPING! The Cimarron 7x7 Commercial L Screen is perfect for heavy usage environments. Frame is made of commercial grade 2" black powder coated steel frame and it has a heavy duty #84 net. FREE SHIPPING! Our Cimarron 7x7 Commercial Frame and Sock Net is great for hitting and throwing drills. One of the strongest frames available. Perfect for heavy usage environments. FREE SHIPPING! The Bownet Portable Baseball / Softball Big Daddy Backstop measures 11' tall x 20' wide x 11' deep and sets up in 3 minutes. This durable screen works great in batting cages where space is an issue, and provides maximum protection. It is built to withstand a pounding and is a good fit for high school / college teams, as well as training facilities. Measures 7' H x 4' W.
Designed for collegiate use, this portable batting cage offers many of the features of the Grand Slam but at a more competitive price. High School Foldable and Portable Batting Cage This unit offers "professional" performance to your high school baseball program. The Pro-Gold II #60 Pitcher's L-Shaped 7'x7' Screen is a heavy duty L Screen with a small cutout to maximize pitcher protection. The Pro-Gold II #36 Mini L-Shaped 7' x 4' Screen will protect your pitchers on the practice field or in the batting cage. FREE SHIPPING! A heavy-duty softball pitching screen perfect for heavy usage environments such as training facilities or high school teams. Frame is made of commercial grade 2" galvanized steel, making it one of the strongest frames available. This multi-sport pop up screen from Champion Sports is great for practice drills. Completely portable, it folds down to fit into a nylon carrying case. Dimensions: 7' x 7'. One of the heaviest and most durable baseball pitching screens available. Many major league players personally use the Armadillo at their training facilities or their own homes. Features a 2" frame with a #60 grade net. FREE SHIPPING! Larger and stronger, the BOWNET ELITE BIG MOUTH is designed for heavy hitters and meant to withstand the rigorous drills of college and pro players. Heavier gauge netting, strong canvas trim, heavy duty steel legs and thicker fiberglass poles make these nets highly durable. FREE SHIPPING! Larger and stronger, the BOWNET ELITE MEGAMOUTH is designed for heavy hitters and meant to withstand the rigorous drills of college and pro players. Heavier gauge netting, strong canvas trim, heavy duty steel legs and thicker fiberglass poles make these nets highly durable. FREE SHIPPING! Protect yourself during pitching practice from the heavy hitters with the Bownet ELITE SERIES L-Screen. Heavy duty knotted screen offers the most protection available. Non-marking rubber feet make it great for indoors or out. FREE SHIPPING! The BowNet Big Mouth 2 is a 21.5' x 8' portable sports net that's great for soft-toss or batting tee practice. Very durable and sets up in 120 seconds with no tools required. Comes with a zippered carrying bag with straps included. The PowerNet 7'x7' Original Sports Net is an affordable and portable baseball training net perfect for tee-ball practice, infield practice, soft-toss, and pitching practice. FREE SHIPPING! A heavy duty L Screen that comes with padding and wheels for maximum protection and movability. Ideal for batting cage tunnels and other areas where space may be limited. #60 Net. FREE SHIPPING! Super durable 7' x 7' Frame with Heavy Duty #60 netting and 2" galvanized steel tubing. Cut-out is 30" H x 24" W. FREE SHIPPING!